Kate and Jon Gosselin filed for divorce on June 22 -- and now they're playing a game of "Musical House"! When Jon comes to Pennsylvania to visit the kids, Kate heads out! "Extra" Lifechanger and clinical psychologist Dr. Gabe Crenshaw understands the exes' arrangement, saying, "Time sharing of the house and kids, I believe in that and I believe that it works." Dr. Gabe stresses that Jon and Kate need to lose the tension, "If parents adjust inappropriately, so will the kids." He adds, "If the parents are on edge, if the parents are frustrated, if the parents are angry, guess what? You've got some angry kids!" Jon has a 22-year-old girlfriend and a new bachelor pad on Manhattan's Upper West Side. People magazine reports the pop of eight moved in to the two-bedroom digs on June 2. GF Hailey Glassman and Jon were spotted in St. Tropez last week, and People's Michelle Tan tells "Extra" he knew the media would attack. Tan says, "Jon realizes there's going to be a lot of scrutiny on his relationship." 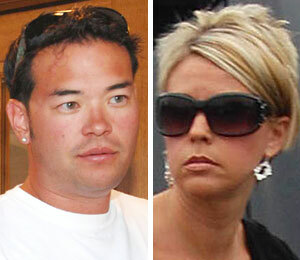 Gosselin and his younger former girlfriend Deanna Hummel didn't last, so will Jon and Hailey make it? Tan thinks their bond is real and Jon is "really just trying to enjoy life."